Even though Jerusalem, Rome and Santiago have been the three great destinations for pilgrims since the Middle Ages, the Way of Saint James (Camino de Santiago) to Santiago is the only one that is still traveled the same way today as it was back then: on foot and with little else than a shoulder pouch. It had been a long time since news of the discovery of the Santiago sepulcher had reached France. Those were dark and dangerous times. Terror broke loose when the Saracen army flattened Compostela. Almanzor had destroyed its basilica and other churches and monasteries. Bishop Diego Peláez decided to build a new church to replace the pre-Romanesque Basilica. We fly over the city of Santiago. From up here, we can see the cathedral and near it, the church of San Félix de Solovio. And it is in this place where chronicles tell of a hermit known as Pelayo who, as he fasted, observed some lights shining on the ancient Roman citadel. Before such news, the bishop arrived at the site and discovered the entrance to a small sepulcher among the weeds. A church was built above the sepulcher to worship the Apostle’s relics. 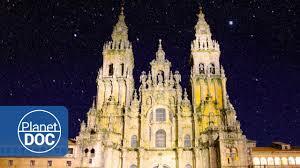 Construction was finished in 830 and Bishop Teodomiro consecrated the first Church of Santiago. In the year 1101, while in Santiago after being named bishop by Pope Paschal II Diego Gelmírez initiated his projects. The first would be the conclusion of the cathedral. It was apparent that if he wanted the Santiago church to become that great Apostolic see, it had to be at the vanguard of art. To this end, he patronized continuous exchanges between Compostelan builders and the most advanced constructors of the times. The Way of St. James (Camino de Santiago) had definitely become a torrent of cultural and artistic exchange between Galicia and the rest of Europe. Diego Gelmírez had achieved all of his goals: the construction of the cathedral was well on its way and it was a benchmark for European Romanesque art. And finally, on April 21 1211, Archbishop Pedro Muñiz, in the presence of King Alfonso IX, consecrated the Romanesque cathedral of Santiago. The visits of Pope John Paul II and later Benedict XVI in the Holy Compostelan year of 2010, surrounded by a fervent multitude of pilgrims from all over the world, through Way of St. James (Camino de Santiago) are a testimony to the magnificent vitality the Jacobean cult has today. But notwithstanding all the changes, the works of Peláez and Gelmírez, of Masters Bernardo, Esteban, Mateo, and countless others, still remain unaltered and recognizable. In the spaces within its naves, columns, tribunes, chapels and porticos, the spirit of all those who contributed to its erection is conserved. Thousands of pilgrims from around the world held each year Way of St. James (Camino de Santiago) to venerate the relics of the Apostle. The Way of St. James (Camino de Santiago) ends in the Cathedral of Santiago de Compostela.